Is my Razer Wolverine Ultimate compatible with Xbox One X? Yes, the Razer Wolverine works with all Xbox One models. Can I use my Razer Wolverine Ultimate on Steam? Certainly! The Razer Wolverine Ultimate is recognized by Steam as an Xbox One controller. Does the "Quick Control Panel" function work on PC? Absolutely! The "Quick Control Panel" functions on your Razer Wolverine Ultimate work, regardless of whether you are on your PC or Xbox One. How do I remap the multi-function buttons on my Razer Wolverine Ultimate? You can perform button re-mapping for your two(2) on-board profiles via the Quick Control Panel on your Razer Wolverine Ultimate directly. To enjoy unlimited profile configurations, you can download the Synapse for Xbox App on any Xbox One console. When using my Razer Wolverine Ultimate, why can't I switch profiles on the Quick Control Panel after quitting the Razer Synapse X app from the Xbox Taskbar? Please unplug and re-plug your controller to recover the switch profile button. Can I disable the multi-function buttons? Release your fingers after the controller vibrates. How do I change the lighting effects on my Razer Wolverine Ultimate? You can personalise your lighting effects through the Synapse for Xbox App on any Xbox One console. Does the lighting effect sync up with my other Razer Chroma-enabled PC peripherals? No, the Chroma on Wolverine Ultimate is designed especially for optimal console user experience. Therefore, it does not sync up with other Razer Chroma-enabled PC peripherals. Can I record macros on the Razer Wolverine Ultimate? While you can remap any of the sixteen(16) buttons on the controller to the multi-function buttons, recording macros is not allowed on Razer Wolverine Ultimate as it is designed specifically for tournament usage and complies with all tournament rules and regulations. Can I use the Razer Wolverine Ultimate as a wireless controller? 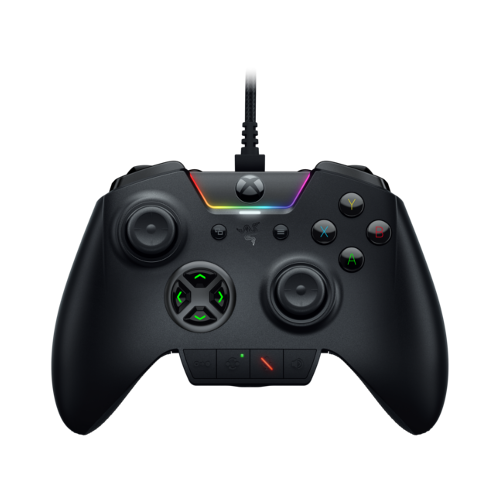 The Razer Wolverine Ultimate is a fully wired controller as it is designed specifically for Esports and requires to have a stable connection and minimal latency for competitive gaming scenario. Why can’t I use the profile switch and button remapping function while my app is active or minimized? When using my Razer Wolverine Ultimate, why can’t I remap buttons and switch profiles on the Quick Control Panel after quitting the app when outside the app? How many D-Pad buttons does the Razer Wolverine Ultimate have? The Razer Wolverine Ultimate comes with two(2) D-pad button layouts. A tilting and individual D-pad. How do I change the interchangeable D-pads and thumbsticks of the Razer Wolverine Ultimate? The interchangeable D-pad and thumbsticks are attached via magnets and can simply be changed by pulling them up. How many multi-function buttons does the Razer Wolverine Ultimate have? It has four(4) back triggers and two(2) bumpers. How many thumbsticks does the Razer Wolverine Ultimate have? The Razer Wolverine Ultimate comes with two(2) lengths of thumbsticks (short and long). What is the weight and size of the Razer Wolverine Ultimate? The Razer Wolverine Ultimate weighs 260 g/0.57 lbs. without the cable. It is 106 mm/4.17 in. long, 156 mm/6.15 in. wide, and 66 mm/2.60 in. high. Does the Razer Wolverine Ultimate have an audio input/output port? Yes, it has a 3.5mm audio port for stereo output and microphone input.